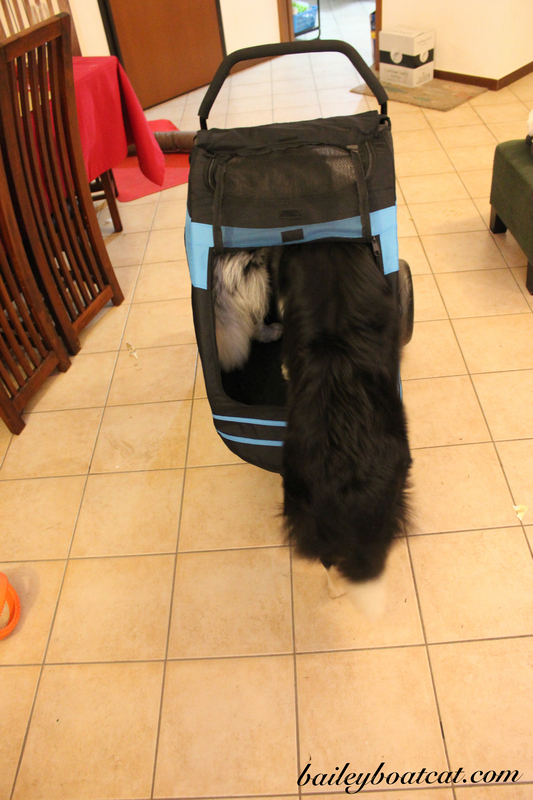 This year one of mum’s Christmas presents was something for her to share with Blue… They got a pet stroller! Blue has special wonky front legs which means he gets tired much faster than April does. So at the moment mum either takes them both on a very short walk, or they go on separate walks. Blue loves his walks and can walk for around 15 minutes before he gets tired and lies down. We are an active family and the puppies would love to go on days out with the humans, but it would be too tiring for Blue sometimes, depending on what they are doing, so we wanted to get something to be sure that he’ll never miss out. April LOVED it straight away, but Blue took a little convincing at first. They played with it at home and got treats for going inside before they had a few test rides around the garden. Once everyone was happy and confident with it they went for their first stroll all together. 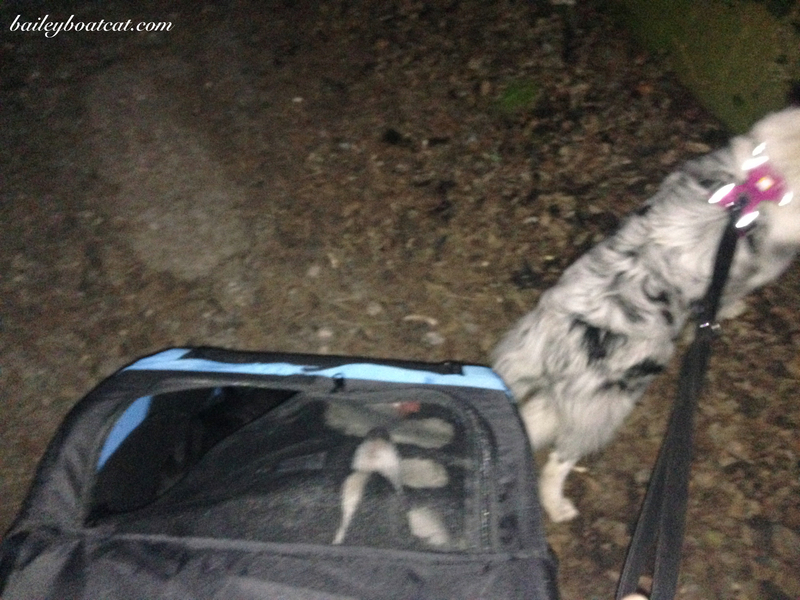 The idea for the stroller is for Blue to walk as much as he wants to and then be able to hop in when he gets tired. He can still enjoy the view and all the smells and fun! (Excuse the darkness of the photos, mum took them on the phone and it gets dark here around 5pm at the moment.) Blue tried it but wasn’t too sure if he liked it. April on the other hand…..
….LOVED it! We couldn’t get the little princess out again! Even when we got home she wanted to be wheeled to the front door! 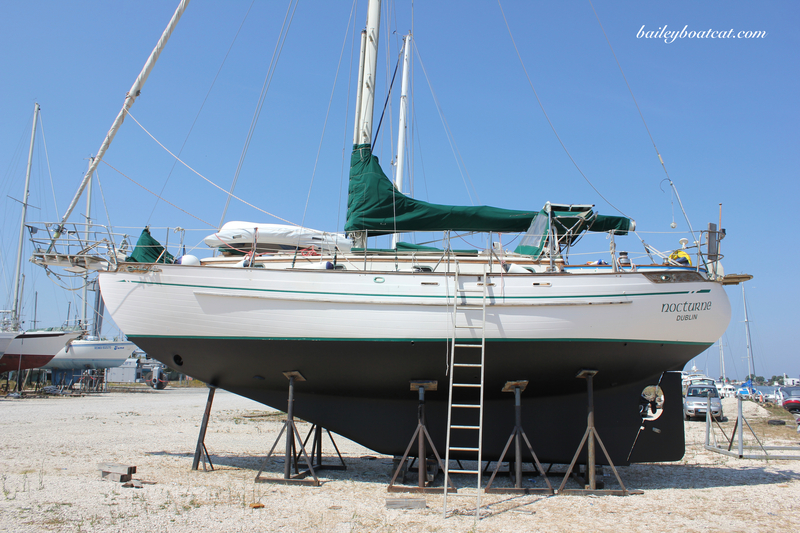 Unfortunately on this, the very first, outing, the zips both broke! They had been cut so it was impossible to thread them again. The quality of the stroller overall was terrible and for a fairly substantial amount of money, we were all disappointed. So we returned it for a refund. We’ve done lots of research and ordered a different stroller though and are impatiently awaiting its arrival. « Dad’s on his way to Australia! Blue is too funny 🙂 I hope your Mom can find a better stroller. 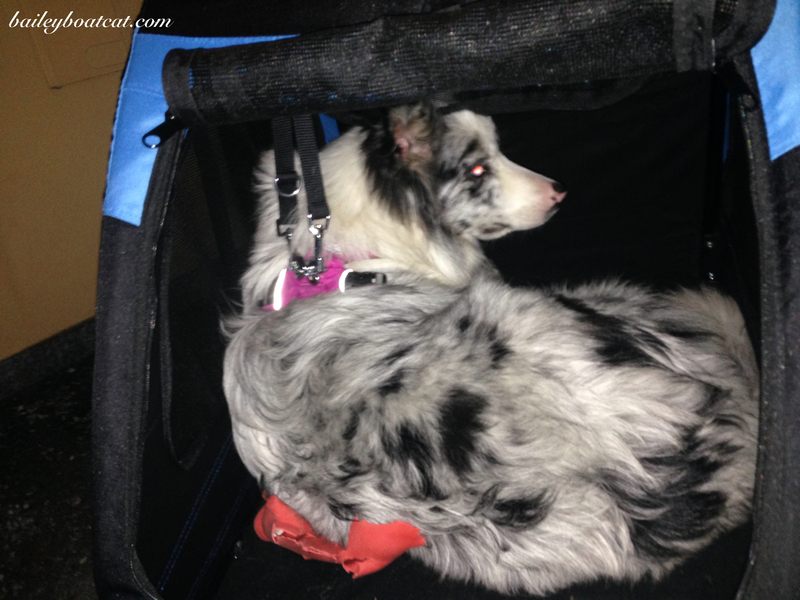 That’s too bad the stroller didn’t work out – I hope you can get a sturdier one, and get Blue to use it! How funny that April, who doesn’t need it, took to it right away. Hi Bailey! We have 2 small pet strollers for our Siamese cats- Snowy and Maui. We had Snowy first. We tried to put them both in the same stroller but we didn’t make it out of the room. We got Maui his own. They love strolling, especially Snowy. 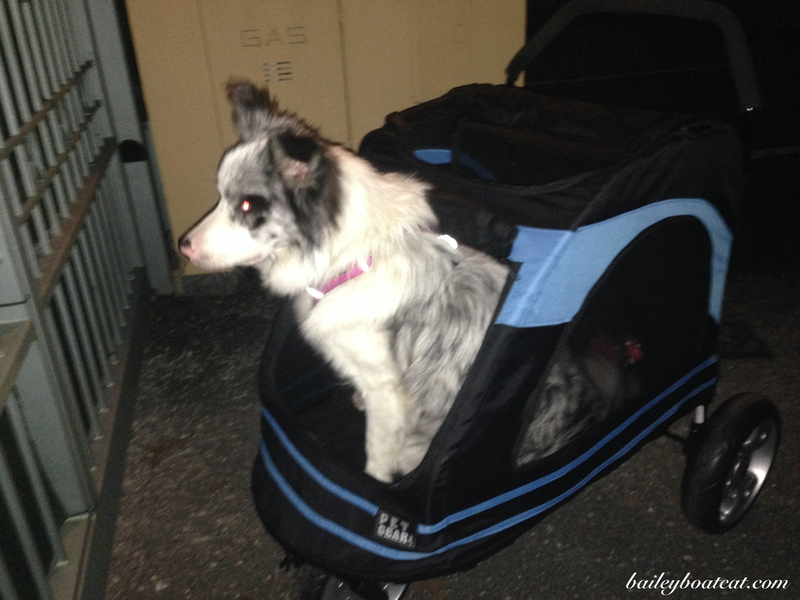 If there is any daylight left when their dad gets home, she will rub straight to her stroller. She doesn’t want to waste anytime on the hellos! What a letdown that the darn thing fell apart ! Glad you were able to get a refund and a better one ! Still, it was a learning experience- although April and Blue kinda acted like cats would, compared to what your folks were hoping for ! IT’s a great idea for Blue if he’ll just USE it! Maybe with a favorite blanket or toy to keep him company he’d be more at ease in it. Obviously April is all for it !! that is a great idea and I hope that once you get the new stroller that Blue will be happy using it so he can be with the family. Too funny that April would be far more interested in it than he is. Surprised you didn’t get a ride, Bailey. 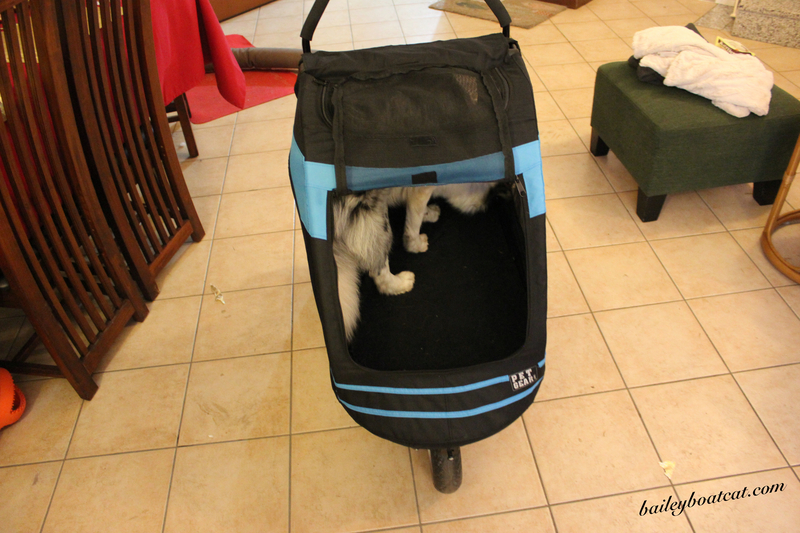 Strollers are very popular with pets and its good to see Blue has one, I had to laugh that April loves it. The stroller was a great idea for Blue. I hope the new one is manufactured better.